“Gamelan” is the name of both the pitched percussion orchestra of Indonesia and the music it performs. The styles most familiar to Western listeners are those used to accompany the shadow puppet plays and dance dramas of Java and Bali, but similar ensembles exist in Thailand, Sumatra, Burma, the Philippines and other areas of Southeast Asia, and even within Java and Bali there are many different regional styles. The keys of the instruments are made of steel, bronze, iron or sometimes bamboo, usually tuned to either a five-note or seven-note scale. 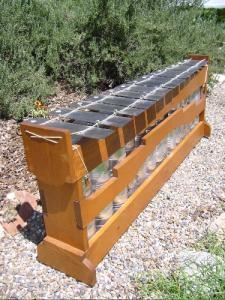 Each gamelan has its own tuning, making instruments from one ensemble generally incompatible with those of another. Gamelan in the USA (and throughout Canada and Europe) falls into two fairly distinct camps, with one concentrating on the traditional repertory of Indonesia, while the other is more concerned with developing a body of contemporary - often experimental - work for these unique instruments. The latter approach has generally come to be referred to as “American Gamelan,” and though it acknowledges a debt to traditional gamelan, it has taken a number of liberties, not only in terms of musical style, structure and performance techniques, but also in the areas of instrument design, construction, materials and tunings. In addition, Western instruments (modified or not), electronics and found objects are often added to the group, in the style of the modern Western percussion ensemble. Gamelan Encantada is firmly rooted in the “American Gamelan” school. 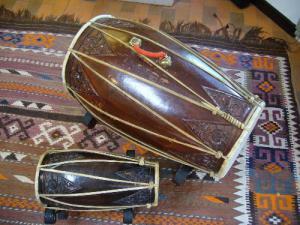 With the exception of the large hanging gongs, which were commissioned for the group and imported from Java and the drums, also from Java, the instruments were built at the request of Jenny DeBouzek in 1991 by Barbara Benary, founder of the New York experimental music ensemble, Gamelan Son of Lion. The keys are made of rolled steel and are tuned to a custom scale devised by Ms. Benary, named “Buffalo” after a similar set built for the State University in Buffalo, NY, and includes instruments in both the traditional five-note “slendro” and seven-note “pelog” scales. The names of the primary melodic instruments from lowest to highest are: Slentem, Demung, Saron and Peking; there are also the Bonang, Bonang Panerus and Gender, which play elaborating or ornamental variations on the main melodic line. 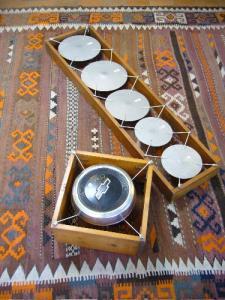 Aluminum Keygongs replace the traditional Kempul, and tuned aluminum disks and hubcaps replicate the sounds of the knobbed horizontal pot-gongs Kenong, Ketuk and Kempyang. Gamelan Encantada functions not only as a performing group, but as a kind of musical social club, as is the practice in Indonesia. The members of the ensemble have varying levels of musical experience and most of them have had no previous gamelan training. In addition to presenting the traditional music of Indonesia (with a focus on Central Java), Gamelan Encantada is committed to commissioning and performing contemporary music, especially that written by New Mexican composers, and to sharing this music with similar ensembles around the country and the world. 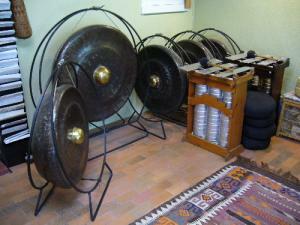 NOTE: In addition to the set of rolled steel instruments that make up Gamelan Encantada, a Balinese iron-keyed Gamelan Selonding set was imported from the village of Tenganan in 1998 by Gamelan Encantada's Artistic Director, Jenny DeBouzek, and is now played by members of the ensemble. Jenny was also an active member of the Kulintang Ensemble of Albuquerque during its existence, and continues to perform and teach the music of the Southern Philippines. In 2015, she was honored with the Pamana Heritage Award by the Filipino American National Historical Society, Rio Grande Chapter. She also served on the faculty of the Santa Fe University of Art and Design, where from 2008-2016, she taught gamelan performance and composition in the Contemporary Music Program.